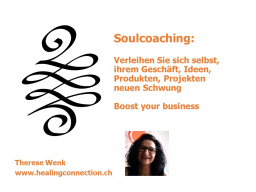 Therese Wenk healingconnection.ch is a Premium member and benefits from additional features. Boost yourself, your business, ideas, products and projects in an unusual way. In this webinar we are working out together a way to recognize, release and transform stagnation into a boost forward. Youll receive a questionnaire to find out where the energies are blocked. At the same time, well be carving out inspiring affirmations to raise your frequencies. This whole process is supported by a guided meditation, where well be tuning into the frequencies of success and abundance. There will be a replay available, so you can work as often as you like with the provided information and meditation. This webinar is also available in German.